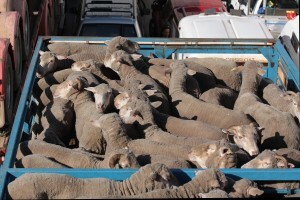 Australian en route for live export. AUSTRALIAN live sheep exporter Wellard has proposed that Middle East importers who sell sheep outside the Exporter Supply Chain Assurance System should not be sold livestock. Australian livestock exporters last week identified Australian sheep in several local markets in Oman that had been sold outside ESCAS supply chains. This prompted exporter representatives to engage Omani traders and the public to bring as many sheep back into approved supply chains as it can, Australian Livestock Exporters’ Council chief executive officer Alison Penfold said. Under ESCAS requirements, Australian livestock must not be sold outside of approved supply chains and cannot be purchased for home slaughter or for slaughter at facilities that have not been approved as meeting international animal welfare standards. Animals Australia has notified the Department of a number of serious ESCAS breaches in Middle Eastern countries. But AA communications director Lisa Chalk said the group would not comment further until its investigators were safely out of the field. “But what the industry is projecting in no way reflects the reality on the ground where once again live export regulations are being blatantly disregarded,” she said. Wellard chief executive officer Mauro Balzarini said it is now crucial that importers who remain ESCAS compliant in any markets are rewarded “and those that choose to systemically rort the system are excluded from buying Australian sheep, because that is how we can make sure the animal welfare outcome is always optimum”. The exporter has called on the Department of Agriculture and Water to come down hard on importers who systemically rort ESCAS, otherwise ESCAS would become a farce and further breaches will occur in the future, it said. Wellard has concluded its Eid al-Adha program in Oman, but has been informed by the Department of Agriculture and Water (DAW) and Meat and Livestock Australia (MLA) that Australian sheep have been detected outside of the ESCAS supply chain in Oman. A list of ear tag details were supplied by DAW and MLA, and the company confirmed that all animals found outside the supply chain originated from properties that were different to the properties Wellard sourced sheep for its consignment to Oman. Wellard said it is co-operating with the DAW to confirm that none of its sheep have been processed outside the approved supply chain and has extra workforce in Oman to assist the importer of Wellard sheep to properly deal with the welfare of the animals. “Assuming no evidence of non-compliance emerges, and we have every expectation that will be the case given the systems we have in place and the commitment of our importer to ESCAS, then it will be three years out of the last four that Wellard has been ESCAS compliant during Eid. “That is a great track record given Eid al-Adha is a period of such great intensity, and I would expect that it is an industry-leading record,” Mr Balzarini. “Wellard invests heavily financially and in human resources in working with our importers to ensure the integrity of the supply chain while meeting the demands of our customers. “We also commend our Omani livestock importer, Al Batina, for its commitment to the program,” he said. Mr Balzarini said ESCAS compliance costs importers hundreds of thousands of dollars of lost sales and their exporters similar amounts in extra staff and costs. “If their competitors pocket the extra money and can continue to do that with little penalty, then compliance becomes a disincentive and the system becomes a farce. Ms Penfold said last week exporters had Australian staff on the ground in Oman supervising the management arrangements at the main operating approved abattoir for Australian sheep over Eid al-Adha, but also had other Australian and locally engaged staff checking in at local markets for illegally removed sheep so they could be returned for sacrificial slaughter at the ESCAS-approved facility Central Slaughterhouse in Muscat. Ms Penfold said Animals Australia also had an investigator in Oman who have separately identified sheep on private sale by local traders at one location and this was reported to the Department on Tuesday. “The report was immediately responded to with staff sent to the location to prevent further sales. Special livestock control systems are implemented for Australian sheep in the six Middle East Australian live sheep markets, over and above ESCAS requirements, to support the traditional rite to sacrifice animals as part of the Eid al-Adha festival which will take place around the world, including in Australia, from September 24-26. But Ms Penfold said the incidents undermined the collaborative efforts of exporters in Oman to develop the special livestock management systems for Eid. “This year we have further extended the use of additional supply chain control in markets like Oman. Ms Penfold said one exporter into Oman has restricted sales of Australian sheep to one abattoir in Muscat to concentrate supervision and oversight of Australian sheep through this high demand 2-3 day festival period. The other exporter is operating live supervised sales out of a limited number of facilities. The main facility used by both exporters only uses the “Mecca Model” of a ticket-based carcase sales system allowing local consumers to buy tickets at one end of the facility and collect carcases at the other. In between the only people handling and slaughtering the livestock are trained stockmen and slaughtermen who are practiced in Halal requirements and operating in abattoirs that meet the Australian ESCAS requirements, ALEC said. Ms Penfold said industry will review its systems at the conclusion of Eid and continue to find and implement measures that prevent Australian sheep from being removed illegally from supply chains at any time of year.